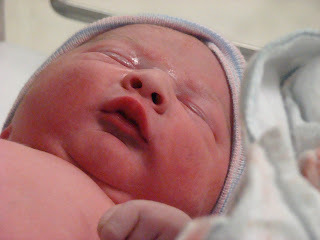 Passages to the Past: Introducing my new nephew! 9 lbs 6 oz. 21 inches. Welcome to the world little man! Aunt Amy can't wait to kiss your sweet cheeks! Congratulations to the proud parents, Melany and Gordon! Kim - I hadn't either, but it's so cute! Just like he is! Thank you! Congratulations. It's a very old name. He's a cutie pie! Awww, Amy, CONGRATULATIONS! He is such a cuddly little bundle! Cute! Congratulations to parents and Aunt Amy! Congratulations Aunt Amy! And to his parents. He is just too cute. Congratulations! Being an aunt is wonderful! Congrats to you. What a great name. I am so happy for you. Being an Auntie rocks! He is adorable! I recently became an aunt (I don't have any siblings but they are my boyfriend's niece and nephew) and am having a wonderful time with them. Enjoy him - he is so precious! Oh my, he's beautiful! Greyson is such a great name. Congrats Aunt Amy and to his parents. Congratulations. Little ones are my favorite. There is just something so pure and uncomplicated about that stage. Congratulations! He is adorable and quite a nice size.